Pat Coate, of Mon@arch Nature Blog, recently took a hike on the North Country/Finger Lakes Trail in Allegany State Park, New York. This is the westernmost section in NY, just before the trail slips into Pennsylvania. She writes, "The section of the trail along Brown Hollow looked down on a babbling brook whose sound was drowned out by the constant sloshing of many feet through the deep carpet of fallen leaves." 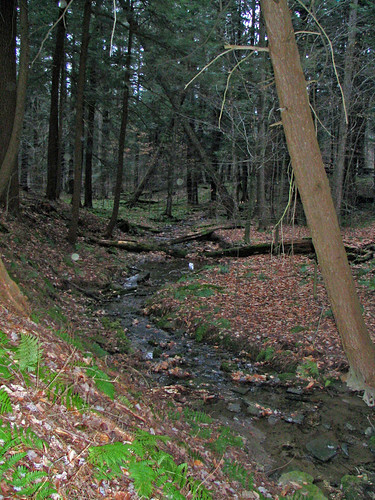 "The following weekend my family hiked the other end of the FLT in Allegany State Park. The trail starts off of exit 19 (Red House Lake exit) on Bay State Road. This too is a beautiful trail. The trail climbs fairly steadily from 1440’ to 2060’ over about a 2 mile stretch, including switchbacks. There are glimpses of the Allegheny River to the west and some nice rock formations along the way." Follow the link above to read the rest of her entry and see more pictures. Looks like a beautiful place to walk! You're right, this trail is beautiful and perfect for bikers and hikers as well.